Key Words: lurking, pleas, protagonists, metaphorical. equally conscious of the difficulties woman undergoes in the process of forging her identity. The traditional woman in Hindu culture was the product of man’s need/requirement. upon the sovereign, a woman must never govern herself as she likes. mythical modes of Sita, Savitri, and Gandhari. husbands as, “the dayan had eaten up her own suhag” (Easy Savitri). belonging. Restraint, control and abstention are looked at as crucial to a widow’s life. absences that determine the predicament of Indian widows. are taken to be immoral and unwomanly. the patriarchal society. She is seen available to them with no choices and desires of her own. transient and had no future, but was enjoying it as much as she could. Mohammad, the mechanic at Mohan Batteries was very much like the others at the place. basic human emotions and sensibilities. it. She is looked down upon for her characterless immoral behavior. “Easy Savitri.” AndyLeelu.com, Dec.2013. Web.4Jan.2014. Jung, Anees. Unveiling India .New Delhi: Penguin Books India.1987. Print. 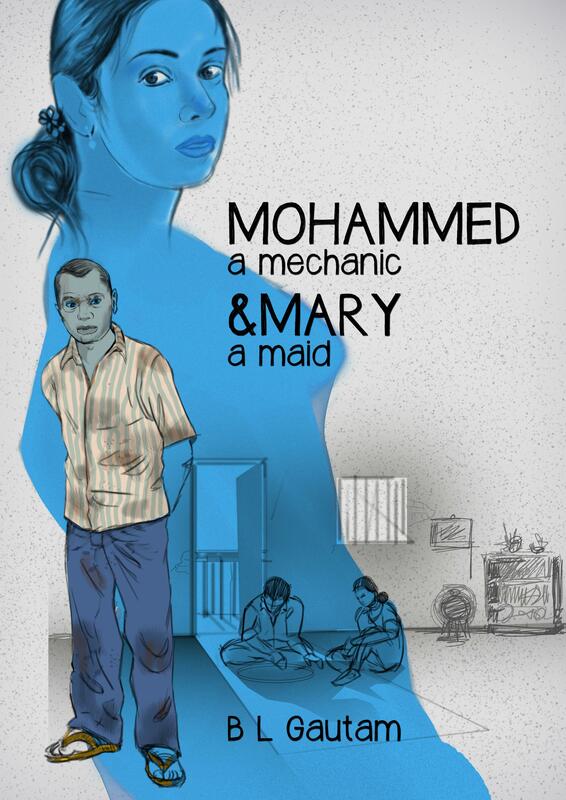 Literary Soujorn: Interview with B L Gautam, Author of Mohammed a Mechanic & Mary a Maid. The two-faced morality is surreptitiously disrobed of its authority by the ‘moonlight infidelity’ that comes as a blissful escape from the tyranny of a barren bed. An ex-customs officer, a distinguished intelligence officer, a film producer (‘Khosla ka Ghosla’ and ‘A Wednesday’), a novelist – all rolled in one. Yes, this is B.L.Gautam. After having experimented with poetry in Hindi and Urdu, he came up with Andy Leelu (reviewed here). It is a pleasure having conducted an e-interview with him and I am glad to be sharing it here with the readers of Literary Sojourn. 1. You seem to be having both sides of your brain extremely well developed. The logical and analytical left side, and thoughtful and intuitive right side. How do you handle both of them which I am sure must have contradicted on several occasions? It’s a compliment, but let me be a little candid here. I strongly believe that we humans are a huge pool of wasted talent. Everyone of us comes with an immense potential. We are ‘chosen ones’ of the nature. It’s the parentage, environment , and the education that makes most of us the ‘foot-soldiers of creativity’, for the mediocrity to thrive. In my innocent belief I was a special child as most of us are, but truly speaking I was not. It was my ‘fool’s promise’ to myself that has driven me through the thick and thin of life. You may call it the ‘mantra of life’ that is engrained into one’s thinking at very early age. You can’t break the promise you make to yourself. The much revered ‘true love’ is nothing but one’s promise to oneself. Brain has two side, no doubt, and most of us have one lesser developed. I was lucky to have some amount of both, but believe me I had neither to the level that makes one a genius. So to say ‘handle both of them’ will be vain, it was in fact a ‘struggle’. The struggle I have now fallen in love with. If you can’t contradict yourself you’re just a depository of other’s knowledge at the best. I was taught to be one in my school. I was considered exceptionally intelligent when I would read a page just once and narrate it verbatim. A time came I found such ‘photographic memory’ completely useless. Now I hardly remember anything of what I read. My mind just takes the essence and moves on. ‘Forgetting’ is what has made me a thinker and a writer. My mind is a clean slate when I set to think about something. For example, a minute back I had no clue what I am going to write in answer to your question. 2. How has the experience been for you as well as for your family in the high risk job as customs officer ? Was moving on a calculated decision? Do you miss the thrill of that job? Exposure to risk in a preventive job comes with some rewards. More so, once you have taken the plunge there’s no looking back. It’s by choice because these guys are hand-picked; unwilling and inefficient will either wriggle out or will be chucked out by the system. You have to know your ‘lakshman rekha’ which has its flexibility and sanctity left up to you to decide since the system has imposed an unflinching trust in you. The risk is calculated or I would say mitigated to an extent, if you do your job with a high level of integrity. The world of smuggling thrives on the idea of quick money, and if they find someone who is infallible, and treats money as if it was nothing more than an evidence of crime; the person becomes a demi-god to the community of offenders. The second thing is the way you handle the power and respect that come with the package; if you get carried way you are doomed. We saw it happening with many of our officers of Customs and Police. Their dishonoring stories are in public now. It could see it coming. To not be perturbed of such eventualities every other day, I adopted a philosophy. I started taking myself a man who was dead yet alive. And I believed I have nothing more to lose. It’s easy to say it in words, but a very tough call when it comes to reality. 3. Why cinema and media after a long service in customs? Is it to satisfy the urge to be in some form of spotlight all the time? My decision was not impulsive nor it was triggered by one single factor. In spite of having a hidden streak of rebellion I was always an obedient son, a loving husband and a zealously protective father, and would think many time before taking any career decision. I had a creative person in me that would prompt me to dabble with theatre and literature, but duty was always first and foremost. I would be lying if I say that I had no desire for recognition. Recognition in my mind was always different than 15 second fame or a picture on page 3. I always dreamt to be famous in a world that would be here after I am gone. A Kabir fascinates me more than a celebrity politician or a film star. After more than 500 years Kabir is a household name, and he’s so relevant even today. The thought that you get to live only once pushes me do so many things in one life. You will be amused to know that I have been making a serious attempt for last thirty five years to decipher the truth of universe. I have an adequate grasp on Quantum Mechanics and Classical Physics to keep my quest meaningfully on. I have added the dimensions of Vedic science to it. When a new finding in theoretical physics vindicates my postulates of Mest Theory, I feel reassured. To put it straight I love cinema as a creative expression, but at the same time I hate the devious power of marketing. Media today abounds unethical practices. Lesser said the better. 4. You are the producer of two critically acclaimed and thought provoking films – ‘Khosla ka Ghonsla’ and ‘A Wednesday’. Do share your intuitive feeling that led you to get actively involved in these films? Yes, it was pure intuition. The scripts caught me by my collar. It was worth risking my comfortable job, both the times. I was very confident of their commercial success, and that’s what made me to stick my neck out in spite of a terrible resistance from the management. A few would know that I made Khosla Ka Ghosla when I was with Zee. Everyone around in the organization thought I should, and I would draw a flak. Contrary to their expectation, the film shaped up well, and behold, the top-brass decided to junk it, unceremoniously. Corporate envy is Machiavellian, I realized. Those were painful days of my life. It set me to rethink whether my decision to come to media was right. I had to pass through an ordeal to see the film released. To the extent, that the savior, in an unsavory way, wanted his name to appear as the producer. Imagine, it was after three years of the film was made. I had no inclination to put my name as producer after I had dared to lock-horns with Zee on matters of ethics. But it was a nightmare convincing other stake holders for such an unreasonable demand. I had set my eyes only on the release of this film. That I did, and rest is history as they say. As if it was not enough, fate had one more round of agony in store for me that came with A Wednesday. I had to recede from my declared position of Producer to Executive Producer, when my boss realized that it was a wonderful film. He had agreed to commission it with an obvious spite, to say the least. To bring these two films to light, I not only lost my peace of years but a few friends too, if I still believe they were once my friends. In a struggle for success, nobody’s nobody’s friend. Media is a lesson in this. Cynical may it sound. 5. How did Andy Leelu start taking shape in your mind and how long did it take to come out with the final product? Are you satisfied with your first book and readers’ response to it? The genesis of Andy Leelu lies in the cynicism, or solitude, I came by thanks to my new job. The choice was either I play the game and be at the helms of affairs or I hang up my boots, and sit in a corner. I was not ready to accept either of the two. And I decided to prove my worth by doing something that would need no one as a partner or an associate. I wanted to go on a lone journey. Writing was the only option. As luck would have it, my job took to me to ( it was alienation to be frank) Mauritius. The serenity of this island was a right match to my melancholy. I had company, sarcasm unintended. I fathomed my life, and what came in revelation was a treasure of stories. It was overwhelming. I had written poems and articles, but never a novel. Writing a novel was intimidating. It was like cruising a vast terrain with unknown contours. The invitation had a deadly yet alluring challenge. I began with my wonder years. Not only the most vivid segment of my memory, it was a momentous period of our history. I got a hazy outline of the story in my mind. I said, here you go, buddy! I poured myself out. The experience was cathartic. In around 8 months I had the first draft in hand. Getting it published would be a mountainous hurdle, I had not realized by then. There were trepidations and travesties, but there was also determination to overcome. It took 4 years for Andy Leelu to hit the stands. 6. What were the challenges that you faced in the literary field while entering in it as an amateur writer? Did your experience in other fields help you in any way? The constituency in India is very small. It’s very unfortunate that we are one of the biggest country in the world with a huge literary inheritance, yet we have a pint-sized publication industry. In comparison to the western world, it’s almost nothing. I had to come to India via USA, a country I have never been to, nor have much love for. We are greedily busy making money, and the culture is left to the vultures. Just imagine when a person of my resources has to struggle so much for his book to get published where would a greenhorn go. On other hand if you look at what is being written here, it’s far from inspiring. Publishing and reading go hand in hand. We are happy aping China while US and Europe, and even Latin America is spending enormous resources to shape up the thoughts of the world. They will be the pioneers of the new era and we are happy to be the workforce. 7. Out of all the roles that you have donned so far, which has given you the most pleasure? 8. You have written some verses in Hindi and Urdu as well. Are you planning to publish them too? After having written prose and poetry both, which form of writing do you feel is more gratifying? 9. How do you want to be remembered as? I take myself a part of this organic universe. To me, independent existence is a fallacy. So would like to be remembered as a person who lived and died for humanity. My pains and pleasures are universal in a sense. MY LETTER TO SWARAJ ABHIYAN- The author of Mohammed a Mechanic & Mary a Maid. Thank you for mailing me the ‘Swaraj Abhiyan’ newsletter. It will be presumptuous to doubt the intent of your resurrection, although it reminds one of a demon that would instantly grow into two like him if torn apart. I know it’s a harsh analogy, but the survival demands every political entity to have a demonic character. Political parties or movements are by their DNA soulless animals, a reason perhaps behind their rapid growth and easy multiplication. You are in fact a milder species of this vile creature. That’s probably because you don’t have the muscle of a brute force today. The only thing you can count on your side is the common political currency – the common man, a term lately beaten to the dust. The man you meet in your gatherings or you otherwise connect with is not a common man in true sense. He is a common man, sick of his commonness. He is a miserable man with political aspirations, and wants to shed his skin in a burning desire to be someone. His tribe is small, but looks big because he doesn’t miss a chance to be at jantar mantar. The real common man or woman is either a bystander or one busy with his work and thoughts. His number is huge. He watches all of you on TV with a sense of disgust. He hates Modi, Kejriwal, Yogendra Yadav and such numerous faces across the political spectrum. He doesn’t say a word in protest because he doesn’t believe the word you speak. He/she is a famous father/ mother/ brother/ sister, and not a unit of political currency for the political parties to pocket. It’s another matter that he/she fatefully lands into one on the day of election, albeit with a complete indifference. He/she is a man/ woman with a soul always afraid of losing a piece of it. He sees you all as those soul stealers. Maxim Gorky had in Nilovana, a Mother in his May Day celebration that was a decade before 1917. The soulless behemoth of communism swayed the world for a long time and then went with the wind. ‘The Mother’ is an immortal story. Communism had no mother, no soul, and it had to die. Where is the mother in your Abhiyan? Without a soul or a mother you look like wolves that didn’t get a piece of the prey, and are back. Those who got a wholesome of the prey are devouring it sitting in their den (Delhi). Again sorry for an unkind analogy.